Hurricane Irma Victims Report Delayed And Denied Claims | The Voss Law Firm, P.C. In the state of Florida there have been over 700,000 claims filed due to damage done from Hurricane Irma, a storm that occurred over a month ago. These claims were first estimated to cost $4.6 billion, yet only about $100 million has been approved and paid out. As of September, third party experts predict the total insured and uninsured losses from wind and flood will range from $42.5 billion to $65 billion. Hurricane Irma caused plenty of flooding, but most of its damage was due to excessive wind that reached up to 185 miles per hour. There have been only 1,419 flood claims filed so far. 269 claims have been settled and paid, 92 have been closed with no payment awarded, and over 1,000 are still open. Although some of these claims have been paid, there are still more than 80% that have not been settled. Furthermore, out of all the claims that have been settled there have been more than 150 complaints submitted. Most of the claims relate to a denial of payment and others are about the extra-long waits victims have experienced. There main reason why there are so many complaints is because of the rise of hurricane deductibles. Most homeowners have a deductible that equals 2 to 5 percent of their home’s worth. That means they must pay a very high amount to even get the repair process started, and many do not have the resources to pay that much out of pocket. 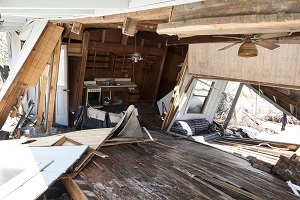 Because of this deductible issue, property owners will absorb $13.1 billion of the damages. Most of the deductible gap cases are insured by private insurance companies, however FEMA is also having difficulty paying out claims. Just last week, according to the Florida Insurance Commissioner, there were 195 National Flood Insurance Program claims closed with payment and 1,936 closed without payment. Florida has the highest number of NFIP policies in the nation. There are 5 million NFIP policies nationwide, and 100,000 in Palm Beach County alone. Only 18 percent of Floridians have flood insurance so many property owners will have to pay for the storm damages then write the amount off as a loss. In addition, new state laws are being introduced which will make it even harder for policy-holders to file claims. Even though most claims are the result of minor damage from falling trees, Hurricane Irma victims are still encouraged to file their claims. Even if they don’t get any funds this time, it counts towards their annual deductibles. This means that if there is another storm this year they will have less of a deductible to claim, and have a higher chance of receiving money for their claim. If you are being harassed or struggling to collect fair payment for losses from Hurricane Irma, the Voss Law Firm can help. The Voss Law Firm fights on behalf of policyholders who have been denied fair coverage for their losses. For more information contact the Voss Law Firm today.